Taking videos is one way of capturing remarkable moments and important events in your life. Unlike photographs, videos are more real because of the visual and audio representations. In the past, only video cameras were used to take long videos while cell phones can be used to take videos of just a few minutes long. Today, Android smartphones such as Samsung Galaxy are capable of taking and storing videos of considerable length. Parents would take videos of some milestones in their babies' lives – their firs smile, their first laugh, their first steps, birthdays, graduation, schools events, debut, and wedding. These are too precious to lose because they are impossible to recapture but there are many instances that can cause your videos to be deleted. Accidentally hitting the delete button while going over your videos can cause you to lose them. You can lose videos when your Samsung Galaxy is accidentally damaged by dropping it into concrete and other hard surfaces or into a wet surface. Computer virus can delete files and your system can be corrupted when you install some software or when there are updates. These occurrences could be disastrous for those who do not know any remedies but for android smartphone owners who are aware of the latest developments in information technology, a solution is easy to find. What are you going to do to retrieve videos that you have lost? 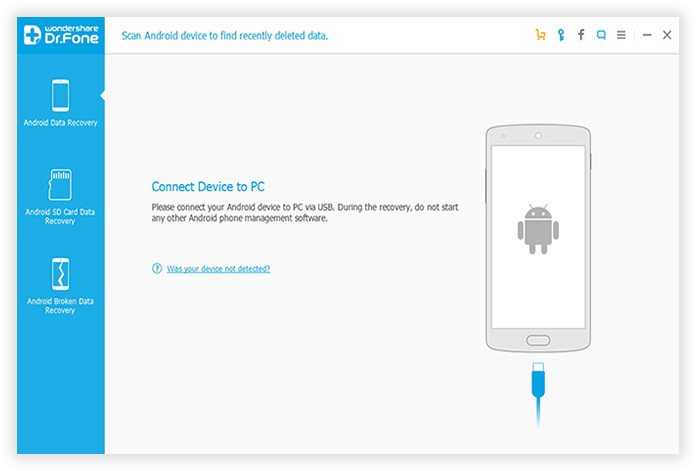 Check Data Recovery for Android application to discover software that has the power to help you recover your videos and other files including retrieve lost SMS, contacts and photos. No matter what reasons leads to your video less, it still can be able to scan and retrieve videos from internal memory and SD card. 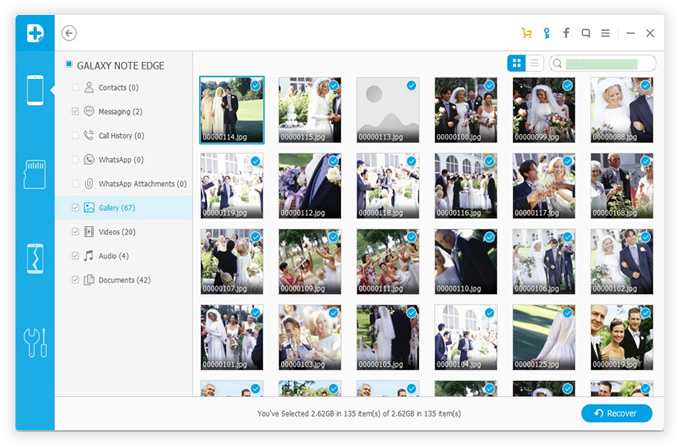 It prevents the loss of your precious videos by finding a way to retrieve them from your Samsung Galaxy S5/6. First of all, please make sure you've installed the application on your PC, and your Samsung galaxy phone is correctly connected to PC via USB. You'll see the interface below. 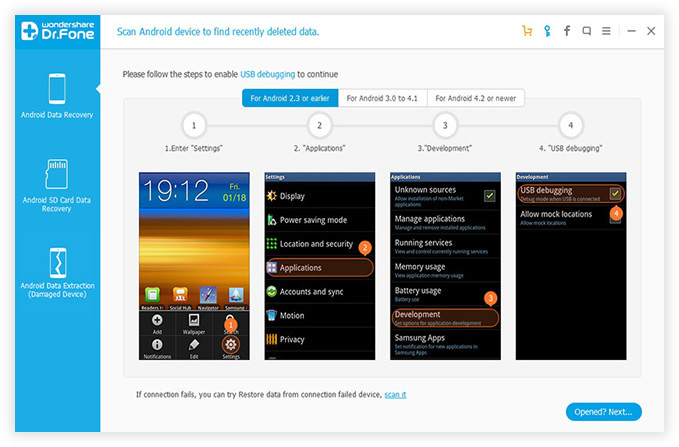 To let the program access to your Samsung phone for scanning, you need to enable USB debugging on your Samsung phone. the debugging process varies for different Android OS, make sure you choose the right one. If your Samsung Galaxy phone was rooted beforehand, the program will ask you for Superuser authorization on the screen of your device, you should press 'OK' on your phone's screen. 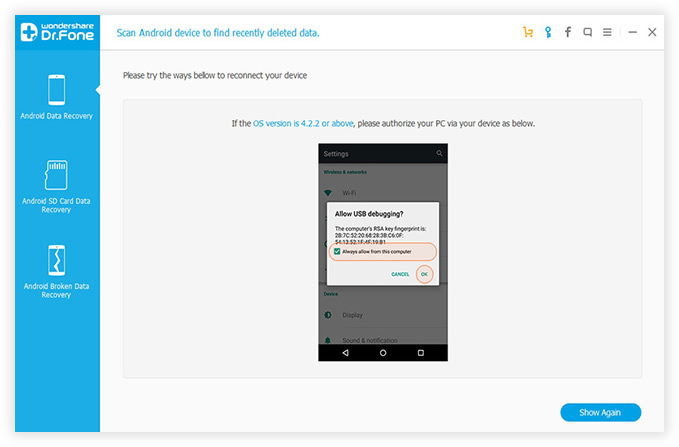 Doing so is to get permissions to deep scan your phone SIM and internal memory. 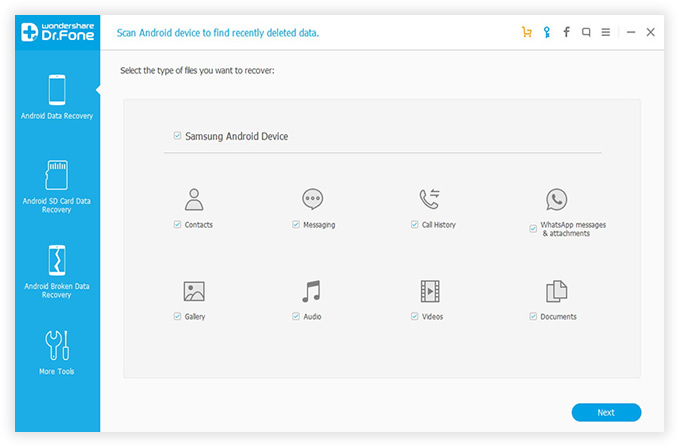 As soon as it identifies your Samsung Galaxy phone, the program will be ready for scanning, there are many data types for your scanning, you can select the type of files you want to scan and recover. This will reduce the scanning time, just mark them and click 'Next'. It will takes from time to scan your Samsung phone, after finishing the scanning process, the program will generate a scan report with details. Just click 'Videos' in the left sidebar, then you can directly preview the video on the right. If you have found the result includes the videos you need. Just directly select it and click the "Recover" button to recover the deleted videos to your computer. A lot of the time you may lose their important videos or other data that they had preserved for long time on Samsung's storage system, it will be a frustrating experience when one of the most treasured files is missing. But there are ways around such situations, here is the tool that can deliver a best result by performing a Samsung Videos Recovery of your lost files. This application is a renowned recovery assistant that is equipped with two scanning abilities before recovery, standard scanning mode and advanced scanning modes, they're furnished with powerful scanning algorithm that can deeply scan lost data on the device, and never damage the current data, get back your lost videos with extreme ease. This program will always protect you and your data against unintentional deletion or loss caused by corrupted files and computer virus. It assures you that it is efficient; your money will be given back to you within a month if you are not satisfied with its performance. Try this app and you will be able to retrieve moves from your Samsung Galaxy even if it does not show signs of life anymore.